And after Jesus death, cover over the most holy part of the Jewish Temple was torn apart, which symbolizes that God is not any more separated from his people. There was tree of live in the Paradise too. The Cross is New Tree of life. 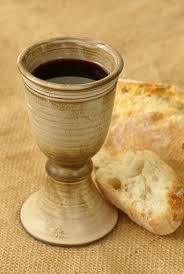 Eucharist- Jesus is the new fruit of life that nourishes supernatural life in us. Paradise happens here on earth again. Walking with God is possible again for everyone of us. Close friendship with him is possible too. He doesn’t ask for a regular dinning room but guest room. He is going to be there as a guest. Room for the First Eucharist is a transitional place, temporary quarter. This reminds me that we are always Guests in God’s accommodations. We are here on the earth only temporarily to move from one place to another. When Jews have Passover they celebrate their passing over from lives of slavery to lives of freedom and abundance in the Promised Land. If we who receive Eucharist live that same lives as unbelievers then what it really does to us? Here in Gods temple, God’s guest room We are being fed and strengthened. That we are just pilgrims, we just pass over from this life to another that we are short time guests her on earth, on transition to the heavenly realities.